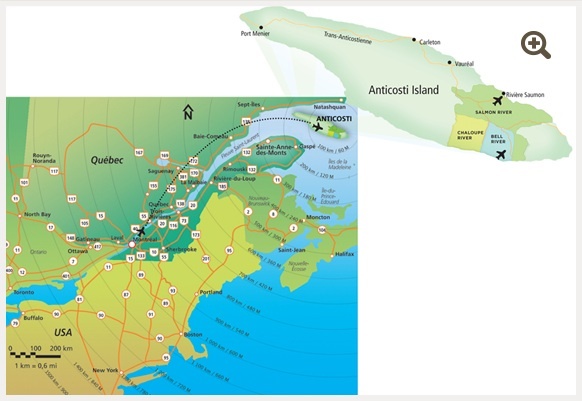 Safari Anticosti Resort, isolated luxury that is jet accessible! The Salmon River sector, situated in the north east sector of Anticosti Island, is home to Safari Lodge. The lodge has its own private and paved runway of 5,600 feet and is also equipped with runway lights for night operations. We also have an alternate gravel runway of 6,000 feet situated in the southeast part of our territory called Bell River. Guests at Safari lodge have the option of flying to the lodge with their own personal aircraft or under additional charter agreements with any other companies offering aircraft charter services. Call us for any air travel related requests.